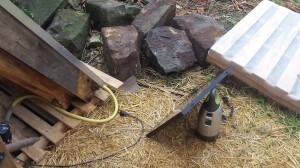 I am pleased to announce that the 150 watt electric terminal has been tested in real conditions at the summer 2012 Francophone Meetings. 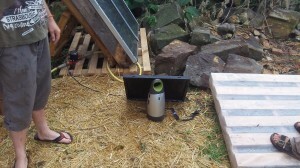 During the summer 2012 Francophone Meetings, there was a water-heater. 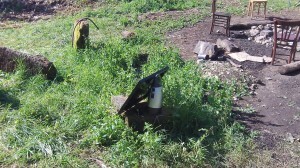 We therefore connected the 220V pump on the electric terminal. With more than 1.400 rpm, the consumption is 33 watts. This allowed the pump to function many hours. Above (photo 2), you can see the back of the installation. 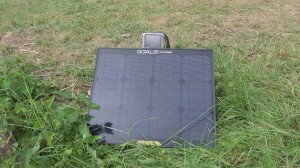 The 30 watt solar panel is connected to the terminal (entry 4,70 mm). The terminal has a 220 V outlet on which the pump was plugged in. Above (photo 3), a side view. Above (photo 4), the 150 watt electric terminal on the morning of Sunday July the 29th, 2012 where we had the chance to have a lot of sun. The terminal charged slower than I imagined. But it still functioned. Above (photo 5), you can see another side view. 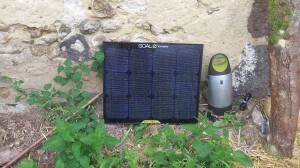 With a handle, the terminal is convenient to put the solar panel on. It doesn’t take too much space and is easily transportable. Above (photo 6), a front view. 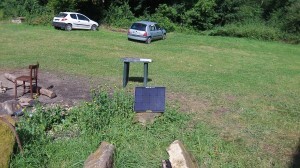 On this picture (photo 7), you can see the 150 watt electric terminal charging a GPS buy Tadalafil (the small dial you see on top of the photovoltaic panel). After a nice weekend in the countryside, the panel got dirty. 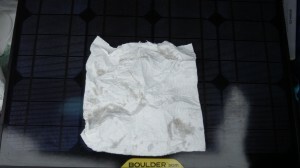 Above (photo 8), you can see the condition of the cloth after wipping the panel (the cleaner the panel, the more electricity transfer per hour is great). On Monday July the 30th, 2012, we had rain. Therefore, the panel was moved places. 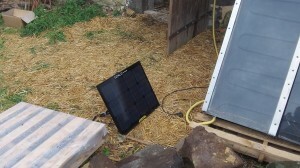 On the above picture (photo 9), the panel is simply laid against the wall of the barn (with a small roof). That way, the terminal is protected from rain and the solar panel can still capture ambiant light. Obviously, in this setting, the amount of watts per hour transfered is less important. But the goal here is to generate a (quasi) continuous source of free energy to charge the terminal (battery) to the maximum. The battery charges slowly. 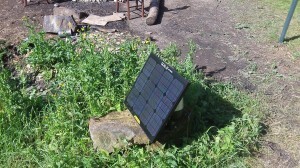 A second day of exposition is therefore necessary if we want to charge the battery to the maximum (150 watts).